The Air Force plans to abandon Area 51, its once-secret air base in Nevada's desert, if June's edition of Popular Mechanics is on target. The magazine's science editor, Jim Wilson, explores the signs in government budgets and in the dust rising from the Groom Lake bed about 110 miles northeast of Las Vegas. 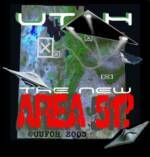 He concludes that fighters and bombers and other invisible aircraft believed to be tested at Area 51 are moving to Utah. Thanks to television, movies, media coverage and a tourism campaign by the state of Nevada, the proving ground for the Stealth fighter, U-2 spy plane and other high-tech aircraft has become a tourist attraction. Some believe the government is hiding a crashed alien spacecraft at Area 51 and trying to learn from the technology. That theory was popularized by the movie "Independence Day." Last year, Gov. Bob Miller dedicated State Route 375, which runs by Area 51, as "The Extraterrestrial Highway." For the festivities, state Sen. Bob Price, D-North Las Vegas -- dressed as Darth Vader -- and Lt. Gov. Lonnie Hammargren packed a silvery alien peeking out from his briefcase. On a more serious note, the Air Force sends a short message to anyone saying it denied Area 51's existence: "Training and testing activities take place at the Groom Dry Lake Bed." In short, the remote desert site, shimmering like a mirage, has become the Air Force's worst-kept secret, Wilson said. Wilson reports that the Air Force had to look for another site to develop ultra-high-performance military aircraft for the next millennium. The new Utah sites also are connected to military activities. The top-secret candidate is White Sands Missile Range, a site in eastern Utah dubbed Area 6413 by the Air Force, according to Wilson. Another suitable launch location seems to be near the Air Force's Michael site just south of the Great Salt Lake. That's also protected by Dugway Proving Ground, the area where tons of U.S. nerve gases and other toxins are stored. By moving to Utah, Wilson guesses, the Air Force is closer to its Space Warfare Center near Colorado Springs, Colo. Wilson discovered these prospective sites in a congressional briefing document and in a leaner military budget. The Air Force Times has reported that flights of CT-43 transports, once ferrying workers between McCarran International Airport and Area 51, now fly to Utah. But Glenn Campbell, director of the Area 51 Research Center in Rachel, disputes the Popular Mechanics report. "The article is rubbish, all rubbish," Campbell said Monday. "I've never seen so much crapola in a national magazine before." Campbell, who has offices in Las Vegas and Rachel, the nearest town to Area 51, said he can look out his Las Vegas apartment window and see the same planes taking off for the Nevada base every day. "I've seen no change in activity at the airport here," Campbell said, adding that Popular Mechanics mentioned him, but never contacted him. The new Utah base has a famous resident already. Las Vegas millionaire Robert Bigelow, Wilson reports, has just purchased the 480-acre Sherman Ranch, the future site of the National Institute for Discovery Science. Its mission will be to conduct scientific studies of crop circles, cattle mutilations and other things that go bump in the night that people have reported for decades. Wilson doesn't think the lore and lure of Nevada's base will disappear when the Air Force moves operations about 1999.